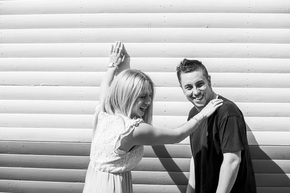 James and Simone's, pre-wedding shoot on Whitstable beach. What a day to pick! Sandwiched between thunderstorms and heavy rain we met James and Simone on Whitstable beach last Saturday for their pre-wedding (engagement) photography shoot. The idea is to get you used to (for an hour or so anyway) being in front of the camera and we can learn a bit more about you as a couple. 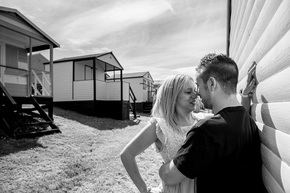 For James and Simone, whilst they're not yet married (Nurstead Court in July) they have all the love between them that many years together brings. James and Simone arrived with James looking as laid back as ever and Simone looking gorgeous and ready for a magazine photo shoot. With a few hours to shoot, we started on the beach at the bottom of Marine Drive and worked our way back towards the harbour via the Lifeguard hut and the beach huts. Finally finishing up at the sailing club with a lot of interested beachgoers. An afternoon filled with laughter and desparate attempts to keep a straight face, here's a selection of the shots from the day. Can't wait for July! Told you it was a private beach! We processed this one a little differently. One our favourites from the day! There it is, the blue steel. Lots of fun trying to work out who was in charge here! And finally, we all like a good reflection. See you soon guys! To full the full gallery from the day, click here.